Important Note: Before applying for student awards for a particular term, please ensure that you are registered for the term with a full-time course load – i.e. you must have already signed up for your required classes. If you are not registered as a full-time student in a post-secondary program, you will not see any awards applications when you get to STEP 3 of the application process. George Brown College's Awards program recognizes students who demonstrate financial need along with academic excellence. Assistance in the form of non-repayable scholarships, awards and bursaries is provided to eligible students to assist them with the costs of their education. Student Awards will allow you to identify the awards, scholarships, and bursaries you may be eligible for, apply online, and track the status of your application. Applications for student awards are now available through the Student Awards tab in Stu-View. For details regarding application deadlines and further information on available awards, scholarships and bursaries please visit the Awards and Scholarships webpage. Registered as a full-time student – i.e. taking at least 60% of a full course load, or at least 40% of a full course load for students with a permanent disability. Continuing Education students and part-time students are not eligible to apply online for awards, scholarships and bursaries. If you are a Continuing Education or part-time student, please contact the Financial Aid office directly to find out about your financial assistance options. Please note: You must be enrolled in full-time classes for the applicable semester in order to view the available bursary, scholarship and awards applications. Login to your STU-VIEW account. Click on the Student Awards tab. Select Apply for Student Awards. You will now see the Select Aid Year and Period page. Carefully read the instructions shown at the top of the page. Click on the Continue button at the bottom of the screen. You will now see the Select an Application page. Select Student Profile from the Application dropdown menu on the Select an Application page. At first, the Student Profile will be the only option displayed in the Application dropdown menu. After you submit your Student Profile, additional awards applications will be available for you to select if you are an eligible student. The Student Profile must be submitted once per academic year. You will now see the Application Confirmation page. Click on the link for the first section—General Questionnaire—to begin filling out your Student Profile. For each section, answer all questions to the best of your ability. 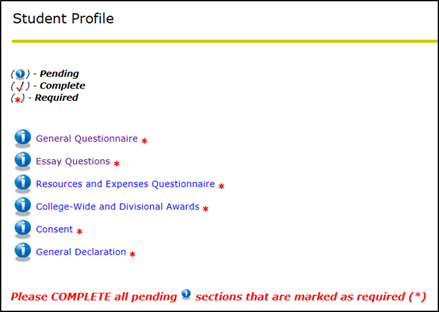 When you have answered all the questions within a section, select Mark this section complete and click on the Continue button to go to the next section. At any time, you can click on the View Sections button to return to the main menu of the Student Profile form. You will see a red checkmark next to each section that you have completed. You will see a blue icon next to each section that is pending (i.e. incomplete). Once you have completed all six (6) required sections — i.e. all sections have a red checkmark — click on the Submit Application button. 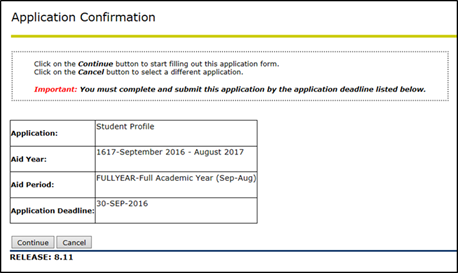 You will now see the Submit Application page with a message confirming that your application was successfully submitted. Select the Click Here to View Additional Awards Applications link on the Submit Application page. (This page is displayed immediately upon submission of the Student Profile). Click on the Student Awards tab and then select Apply for Student Awards. Please note: If you have not yet registered for the term with a full-time course load in a post-secondary program, you will not be able to continue. Instead, you will see the following message: "THERE ARE NO AWARDS APPLICATIONS AVAILABLE." If you later register for classes with a full-time course load, please re-submit your Student Profile and then continue with STEP 3. 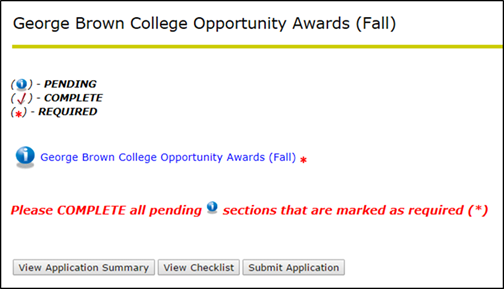 Use the Application dropdown menu to see the awards applications that are available to you. Please note: The awards applications which appear in the Application dropdown menu will vary according to your program registration, course load, and declaration of identity. You will only be shown applications for awards groups that you may potentially be eligible for. DISCLAIMER: This image is for illustration purposes only. You may not see these particular awards applications as part of your application process. In most cases, individual awards will not appear on the awards applications. Instead, you will be asked to apply for an awards group—e.g. George Brown College Entrance Awards—and you will then be considered for all the individual awards within that group. Select an application from the Application dropdown menu. DISCLAIMER:This image is for illustration purposes only. You may not see these particular awards applications as part of your application process. Click on the Continue button at the bottom of the Select an Application screen. You will now see the Application Confirmation page. Please be sure to note the application deadline for the selected application. Click on the Continue button at the bottom of the Application Confirmation screen. You will now see the main menu for the selected application form, with a link to each section. Required sections are marked with a red asterisk (*). Click on the link to go to the corresponding section. You will now see all the awards that are available within this section. 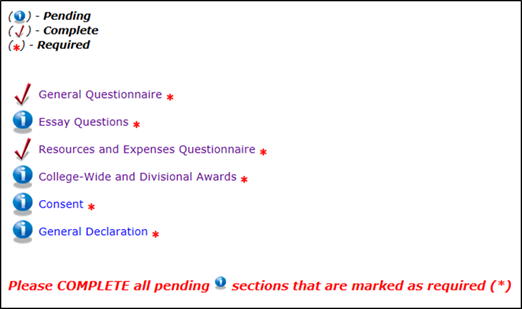 Awards that are marked with a red asterisk (*) are required – i.e. you must click through to apply. Click on each link to view the application for a particular award or awards group. Answer all the questions displayed on the application, if any. 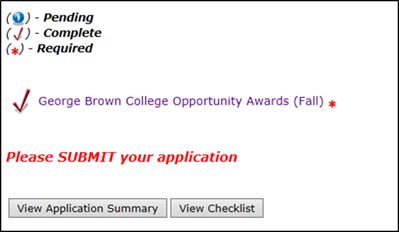 Click on the Apply for this award checkbox. Please note: If you do not select this checkbox, you will not be considered for the award/awards group. The word "SELECTED" will now appear next to the name of each award that you have applied for. If you do not see "SELECTED" next to the name of an award, you have not applied for this award. Once you have applied for all required awards within a section—i.e. each award is marked "SELECTED"—click on the Mark this section complete checkbox. Click on the Continue button to go to the next section. At any time, you can click on the View Sections button to return to the main menu of the selected application form. You will see a red checkmark next to each section that you have completed—click through to see which awards you've selected (i.e. applied for). Once you have completed all required sections — i.e. all required sections have a red checkmark — click on the Submit Application button. Select the Click Here to View Additional Awards Applications link to select a different awards group application. Please note: You must complete STEP 4 for each awards group application separately. You will now see the My Applications page which includes a list of all your existing applications, along with the application status and deadline. Note your status for each application. To be considered for student awards, your application must be "Submitted" prior to the application deadline. Click on the View/Modify link to make changes to your Student Profile or awards application(s). Click on the Generate PDF Application link to retrieve a PDF overview of your application. Click on the Create New Application for Student Awards link to begin a new awards application. Please note that the View/Modify link will not be available if the application deadline has passed. Click on the View/Modify Sections button to re-open your application. Update your application information as needed. Click on the Submit Application button to re-submit the application. Please note that award results will be posted near the end of the applicable semester. 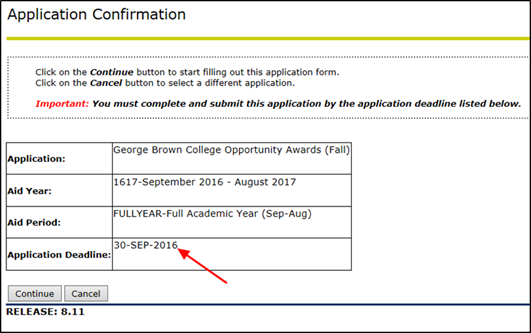 If you experience any issues with the online application, e-mail awards@georgebrown.ca for assistance. Please be sure to read this entire document prior to submitting an email inquiry.